Découvrez, au travers de cette interview l’histoire d’Uko Creative. 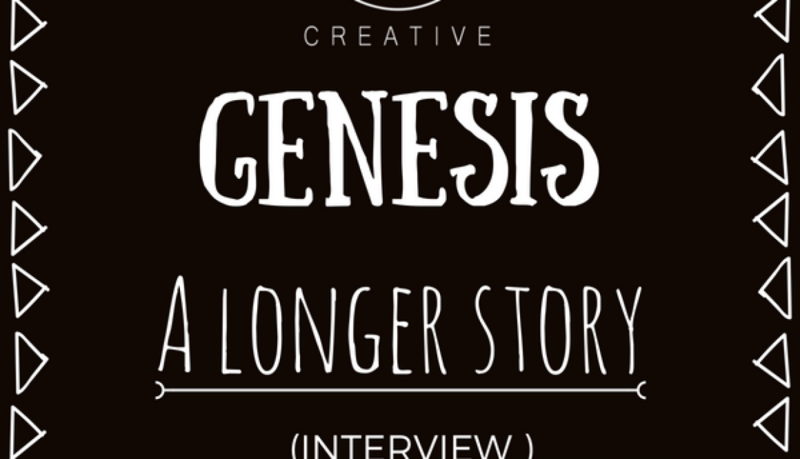 Discover, through this interview, the story of Uko Creative. 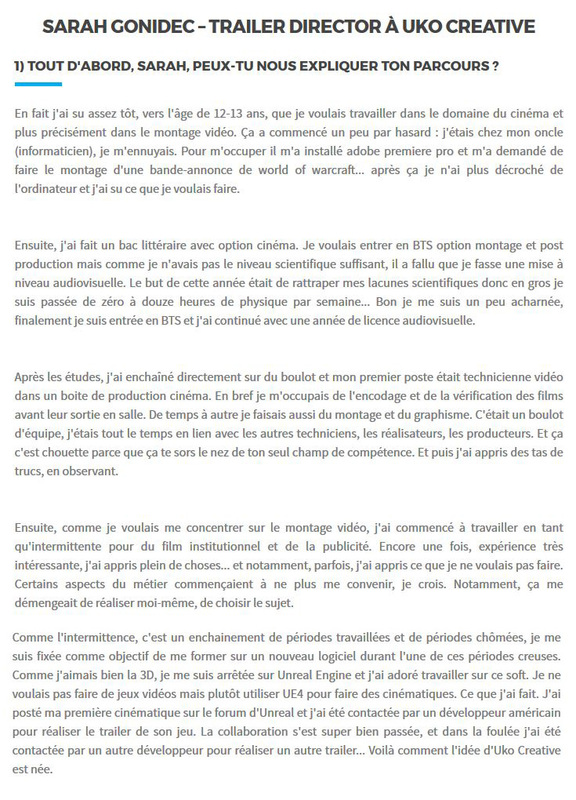 Une plus longue histoire On dit tout en interview..
A longer story We say everything in interview..
1) First of all, Sarah, can you explain your career history ? In fact I rapidly knew , around the age of 12-13, that I wanted to work in the field of cinema and more specifically in video editing. It started by accident: I was at my uncle’s house (computer engineer), I was bored. To take care of me he installed on my computer adobe premiere pro and asked me to edit a trailer of world of warcraft … after that I knew what I wanted to do. Then I did a literature baccalauréat with cinema option. I wanted to have an advanced technician’s certificate in video editin but my scientific level was too bad. So I had to do a preparatory class . The goal of this year was to make up my scientific gap so basically I went from zero to twelve hours of physics a week … Well it was hard but finally I could do & have my advanced technician’s certificate. After that I did an audiovisual bachelor’s degree. After graduation, I directly work and my first job was to be a video technician in a movie production company. In short I took care of the encoding and checking films before their release in theaters. From time to time I also did video editing and motion design. It was a team job, I was always in touch with other technicians, directors, producers. And that’s nice because it gets your nose out of your one area of expertise. And then I learned a lot of things, observing. Then, as I wanted to focus on video editing, I started working as temporary show business worker for institutional film and advertising. Once again, very interesting experience, I learned many things… and in particular, sometimes, I learned what I did not want to do. I think some aspects of the job were starting to not suit me anymore. Notably, I wanted to realize myself, to choose the subject. As intermittence is a series of periods worked and periods off, I started to learn a new software during one of these off periods. As I liked 3D, I choosed to work on Unreal Engine and loved this software. I didn’t want to make video games but rather use UE4 to make kinematics. What I did. I posted my first kinematics on the Unreal forum and I was contacted by an American developer to make a trailer for his game. The collaboration went really well, and in the process I was contacted by another developer to make another trailer… This is how Uko Creative’s idea is born. 2) Are the trailers you make today in the video game industry are far from those you used to make in the movie industry? Of course it’s not the same job! Finally, it’s much more specialized to make a trailer for a game. A movie is still a movie. All the codes are already there, the narration, the tension, the rhythm, you start with a material that is made for that, to be narrative, to be just « watched ». 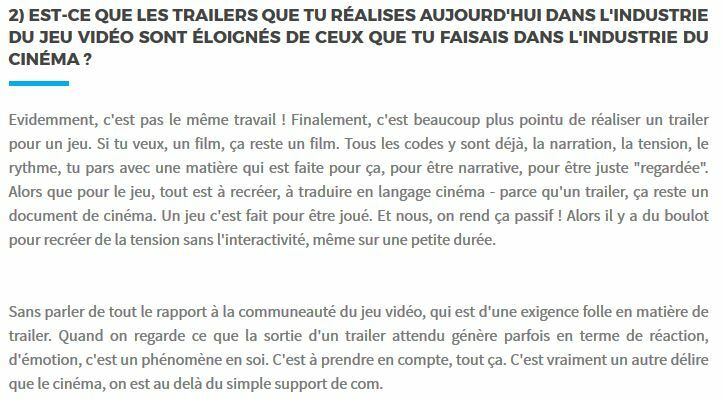 While for the game, everything has to be recreated, translated into cinema language – because a trailer is still a cinema document. A game is made to be played. And we make it passive! So there is work to recreate tension without interactivity, even on a short period of time. Not to mention the whole relationship to the video game community, which is demanding. When we look at what the release of an expected trailer sometimes generates in terms of reaction, emotion, it is a phenomenon in itself. This is really different from cinema, we are beyond the simple support of communication. 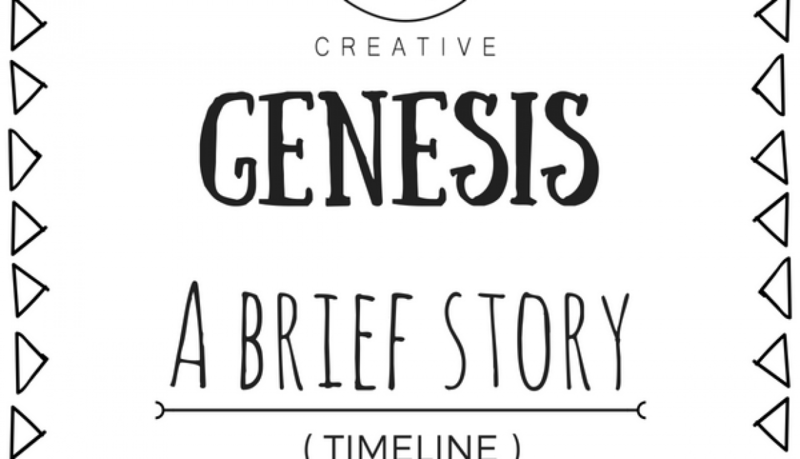 3) How do you create the storyboard that will serve as the background for the whole design? To get there, we work in stages, so I start from stage 1, which is to play the game for which we will work. It will allow us to understand the atmosphere of the game, the important points, and what we will want to highlight etc.. Then I write a plot, ideas, concepts then a scenario which will be used as a basis for the realization of the trailer. After that, I’m gonna draw a first storyboard. I think about the shots, the rhythm I want to give to the trailer. Once I am convinced of my « storyboard sketch » I work in pairs with Ann Lou who is a storyboarder in Uko. Ann Lou comes from comics and our teamwork is very interesting because she will have ideas for framing, rhythm, narration, different from mine and that brings a lot to the originality of our work, and its relevance finally. Once the paper storyboard is finished, we test our idea to the end by making an animated storyboard. It’s very practical because it also allows the studios to see concretely what the video will look like, to have an idea of the sound, the durations, the global dynamism. It’s not an obvious thing to see on paper. 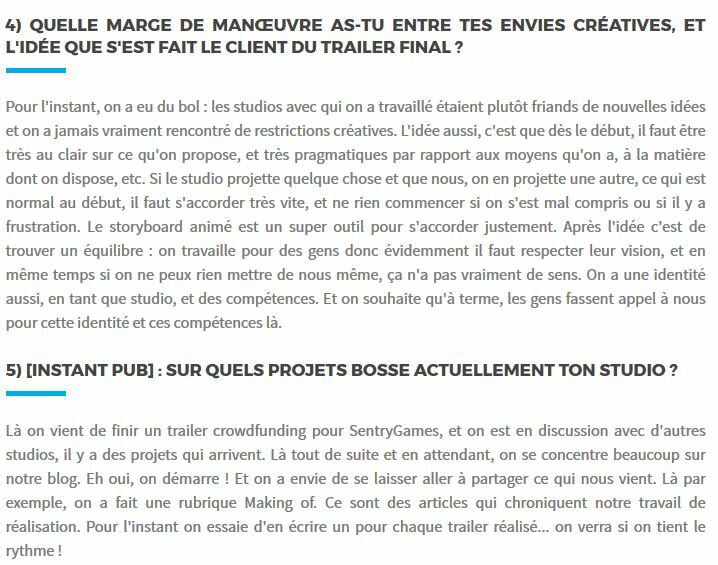 4) What room for manoeuvre do you have between your creative desires and the customer’s idea of the final trailer? So far, we’ve been lucky: the studios we’ve worked with have been pretty keen on new ideas and we’ve never really encountered creative restrictions. The other idea is that from the outset, we must be very clear about what we are proposing, and very pragmatic about the means we have, the material we have, and so on. If the studio plans something and we plan another, which is normal at the beginning, we have to agree very quickly, and not start anything if we misunderstood or if there is frustration. The animated storyboard is a great tool for that. The idea is to find a balance: we work for people so obviously we have to respect their vision, and at the same time if we can’t put anything of ourselves, it doesn’t really make sense. We also have an identity, as a studio, and skills. And we hope that, in the long run, people will turn to us for this identity and these skills. 5) What projects is your studio currently working on? We just finished a crowdfunding trailer for SentryGames, and we are in discussion with other studios, there are projects coming up. Right now and in the meantime, we’re focusing a lot on our blog. Yes, we’re starting! And we want to share what comes to us. There, for example, we did a Making of section. These are articles that review the way we work. For now we try to write one for each trailer made… we’ll see if we keep the rhythm! 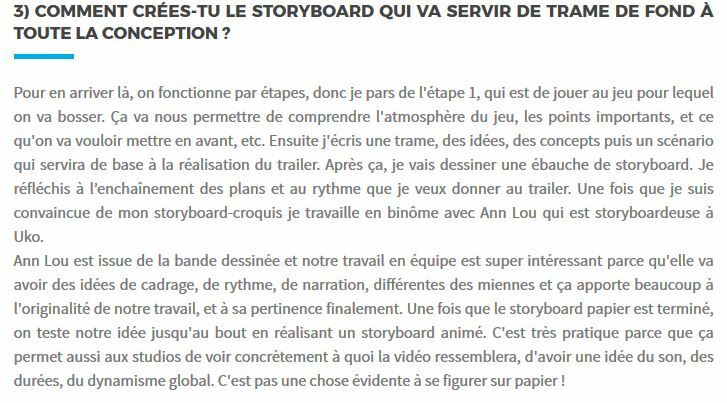 6) What are the different « trades » that make up a team when creating a trailer, and what is the role of each of them? I’m really glad you asked that question because teamwork is something we really value. It’s true that there are many ways to make a trailer. There are some who do this alone, we decided to do them together. Actually, I just find it much more efficient and enjoyable at the same time. It allows you to integrate people from different backgrounds (cinema, cartoons, comics, video games…) and thus enrich the trailer with all these skills which complement each other well and which stimulate each other. If it fits humanly, I think it’s really relevant to work like that. To answer your question precisely, we are generally 5 for a video: the director, the storyboarder, the 2D/3D graphic designer, the sound engineer, the actors (if there are voices to record). It is a general case, the teams will be very different if we make a 3D kinematics for example. 7) Finally, what skills do you consider essential in order to be a good trailer director? I would say that the most important thing, artistically speaking, is to know how to tell stories. The first thing I was told when I started video editing was, « No matter how long your video is, even if it’s only 10 seconds, you have to tell something. » So of course It’s something you learn, it’s not innate. 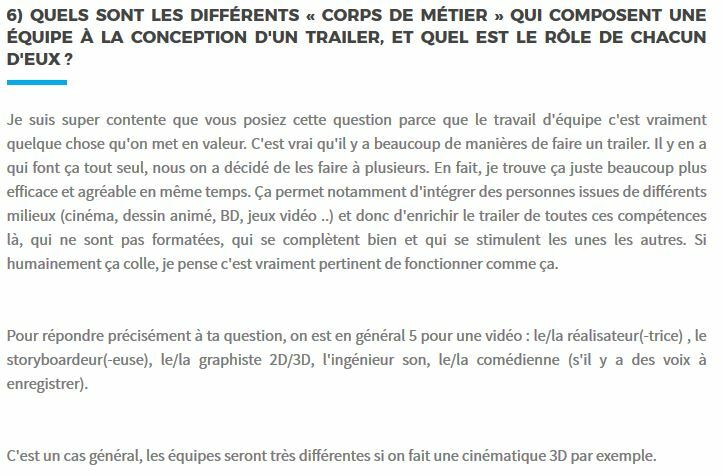 What I would really recommend to people who want to be trailer directors is not to be satisfied with video games: there are a lot of types of narration : music, painting, literature, cinema, comics, are also great sources of inspiration. Oh yes, and the sense of rhythm!